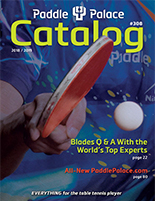 The Nittaku Paddle Palace J-Top 40+ training ball is available in a bulk-pack of 10 dozen (120) balls. It is made in Japan by Nittaku. This is the high-quality, affordable, bulk-pack poly practice ball you've been waiting for! It plays like the Premium 40+ ball, and it is consistent and round, but it is an affordable training ball that is perfect for multi-ball practice and for robots. NOW AVAILABLE IN WHITE OR ORANGE! these balls are the best. I have used 3-star poly balls and they get a crack in them after a weeks play. These ones I have been playing with them for a month and they are as good as new. WOW, what a great ball! Wow, what a great ball. Everyone loves it at the Eugene TT Club! Wonderful value. This ball is so good when I put into my iPong robot, it is consistence on weight and size. This iPong is very restrict on the ball size, otherwise it will not work well. I immediately order another box (10 doze). It also play good, feel fast and easier get loop shot. I like it very much. I recently bought 10 dozen of this ball for practice/multi-ball. I'm not sure why they are called practice balls, as in my opinion these are top of the line tournament balls. In fact I think they are just as good as the Nittaku 3 star plastic balls. In some respects they are better. I measured 6 new 3 star, and 6 new J-Top balls and found that the J-Top is more round, and more consistent in size than the 3 star. It's 7% lighter than the 3 star, but it does not feel so when playing. These balls are hard, very lively, bounce just as high, and go thru the air arrow straight, with no visible wobble. They are completely consistent from ball to ball. They are made by Nittaku for Paddle Palace, using the same plastic as the 3 star. So not a surprise that they would be so good. I bought them on sale for $76.50, so that's just 65 cents each. So don't waste your time and money on any other practice ball when you can have the best of the best. Every other manufacturer of poly balls should be aiming to compete with Nittaku's 40+ balls. They have a nice solid weight to them. They bounce properly and are predictable. I agree that these training balls are better than most non-training balls from other manufacturers. Our club leader brought in a couple of boxes of the J-Top training ball. They were excellent. In fact, I thought they played closer to the top of the line nittaku poly premium 3 star ball than any other poly 3 star ball I have tried, including poly balls from: xushaofa, xin he, dhs, double happiness, joola, and butterfly. Really great ball, let alone practice ball.